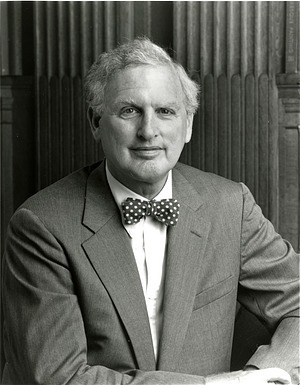 I. Michael Heyman, a law professor and chancellor at the University California at Berkeley, served as the tenth Smithsonian Secretary from 1994 to 1999. Born in 1930 in New York City, he received the JD from Yale Law School after serving as a US Marine Corps Officer in the Korean War. Before returning to academia to teach, Heyman worked as a law clerk for Chief Justice Earl Warren. He then accepted a law professorship at Berkeley and remained there for over twenty years. In 1990, Heyman was appointed to the Smithsonian Board of Regents and remained in his post until he took on his role as the Institution’s Secretary in 1994. At his installation ceremony on September 19, 1994, Heyman remarked that “Every Secretarial era reflects unique circumstances and poses its own opportunities and problems.” He quickly found out how true his statement was. Stepping into the Office of the Secretary, Heyman inherited several challenges from his predecessor Robert McCormick Adams, including the challenges of the Enola Gay controversy, the Institution's deteriorating facilities, and the pressing need for more funding. The Enola Gay exhibit was planned to mark the fiftieth anniversary of the atomic bombing of Hiroshima. Curators from the National Air and Space Museum began drafting the exhibit in 1988. The exhibit aimed to present a historical interpretation of the World War II event with a display of the newly refurbished B-29, the Enola Gay—the first aircraft to drop an atomic bomb as a weapon of war. The exhibit engendered criticism from the beginning, but the controversy boiled over under Heyman. In response to groups who believed that the exhibit focused more on the causalities of the bombing than the reasons for it, Heyman scaled down the exhibit. The new exhibit displayed the plane and contained little interpretation. Consequently, historians, museum professionals, and other observers questioned whether the exhibit was censored too much. Heyman weathered that storm and in the aftermath established new guidelines for exhibition planning. 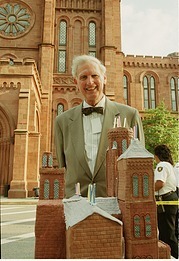 Among the highlights of Heyman’s tenure was the Smithsonian's 150th anniversary celebration in 1996, culminating with the Birthday Party on the Mall on August 10th. Heyman sought to extend the Institution's reach far beyond the nation's capital. He launched the Institution’s first website in 1995 and a year later, a website to celebrate the 150th anniversary. He also sent the America's Smithsonian exhibit across the country to display the Smithsonian’s many treasures, and created an Affiliations Program to share resources with other museums. 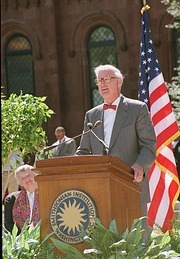 Heyman tried as well to increase the diversity of the Institution, and on May 5, 1997, oversaw the establishment of the Smithsonian Latino Center. Heyman launched a capital campaign to increase funding and improve the Institution’s facilities. He cultivated good relationships with the US Congress and persuaded lawmakers to give the Institution $40 million in 1999 to renovate the heavily trafficked buildings. Under his leadership, the Steven F. Udvar-Hazy Center donation was secured for the creation of a new facility for the Air and Space Museum, and federal and trust funds were partially raised for the National Museum of the American Indian. Shortly before his retirement in 1999, Heyman officiated at the groundbreaking for the American Indian Museum. Heyman also consolidated the many Smithsonian business activities into a single entity, Smithsonian Business Ventures. Although he dealt with exhibit controversy, Heyman renewed interest in the Institution through its 150th anniversary celebration with a touring exhibit nationwide and the launching of the Smithsonian’s presence on the world wide web. He also secured funding for new facilities such as the National Air and Space Museum and National Museum of the American Indian, and continued to expand the Institution. After his retirement in 1999, he returned to the law school at the University of California at Berkeley.